← A long time ago…on Barsoom? Wow...this looks really good on me. Hope I get to wear it again. If you’re a geek-movie fan like I am, there are moments you’ll readily identify in nearly every pic in the genre. 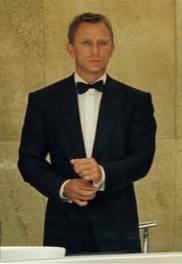 James Bond puts on the tuxedo for the first time in Casino Royale. Batman catches a villain from behind and growls, “I’m Batman.” (Both Michael Keaton and Christian Bale had that pleasure.) Aragorn rides forth wearing the symbol Gondor in the final battle in Return of the King. There’s a bunch of books that have similar iconic moments, but I’m deliberately going for the immensely popular images we see in movies here. That’s because we already knew what would happen to these characters. Bond in Casino Royale was just at the start of his career, and we knew he and that tux would have a long history of kick-assery together. Batman wasn’t just scaring some thug; he also was owning the fact that, yes, he was a guy in a costume doing something crazy and dangerous. And Aragorn, well…he was fulfilling the classic Campbell hero’s journey, finally coming back home to free his people. All of these characters had just escaped from their origins to fulfill their destinies. I bring this up because I’m writing my own origin story of a particularly beloved character (who is, for the record, in the public domain). And it’s been fascinating for me to see how other iconic characters known around the world are created and re-created regularly. Look at Sherlock Holmes or, better yet, the BBC’s excellent Sherlock series. Spider-Man gets the reboot this summer, with Superman hot on his heels. We know these characters, and yet we pay good money to see them be reborn, over and over again. Why? So, I put it to you, gentle reader: What makes a good origin story? Do you like seeing it go far afield, or do you like it to stick to “canon,” as it were? Does the story have to hit ALL the legendary notes, or can it throw in a few twists and changes? What’s your favorite example of an origin story that really worked?